With our family’s upcoming move into an RV looming closer with each passing day, I have recently discovered that I am becoming critical of every single thing that comes into my home. I find myself saying, “Is this product important enough to our family that it deserves space in our future tiny house?” More and more, the answer is “no”. 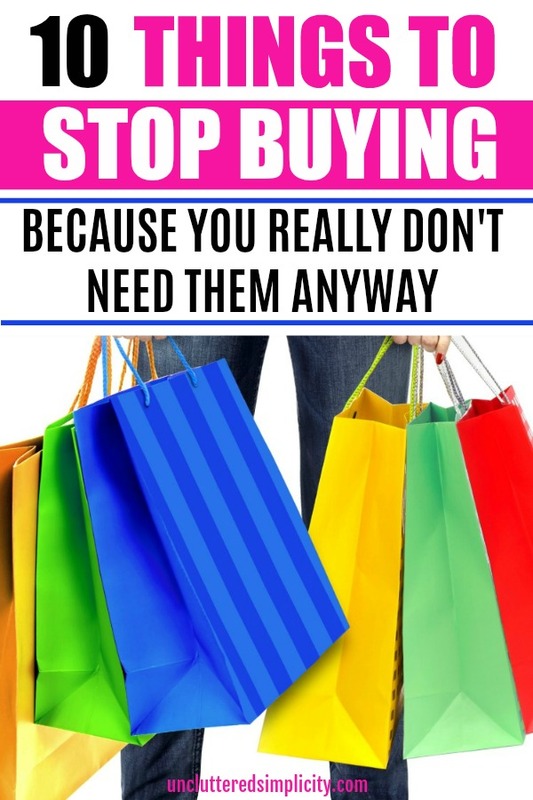 In fact, there are so many things to stop buying because I really don’t need them. I’ll bet you can relate. It’s not super-hard to buy a larger bag or a box of something and repackage it yourself into smaller containers. So why is it I continue buying snack sizes of anything? Just seeing all of the extra waste created simply because we crave convenience drives me nuts. Really, it would only take me a few extra minutes when I get home from the grocery store to do this. Have you ever timed how long it takes to wash a plate? I haven’t, but I know it can’t be more than a few seconds. Even less if you use a dishwasher. Too often, I find myself reaching for a paper plate when we could just as easily use a regular plate. If I stopped buying them, I wouldn’t be able to use them. Problem solved. My household cleaners consist of Dawn dish detergent, dishwashing tablets, laundry detergent, bleach, Scrubbing Bubbles, Comet, and Mr. Clean multi-purpose cleaner. I use this steam mop on my hard floors. I think I can reduce this list further by making my own cleaning products and using essential oils. Although, I haven’t had much luck with homemade dish soap, laundry soap, and dishwashing detergent. I absolutely refuse to purchase an outfit that will only be worn once or twice per year. Our family has found ways to “dress up” our regular clothing for special occasions. I guess I can cross this one off my list! I am a minimalist, but my dog is not! Somehow, she has ended up with more toys than she needs. Honestly, I rarely watch tv anymore. If it weren’t for wrestling (which my husband enjoys watching), Hulu would be history. Each standard network (CW, ABC, NBC, etc.) has their own app so I could watch the latest episodes for free on my Apple TV. Netflix is a little more tricky. They have me hooked on some of their original shows. Daredevil, Stranger Things, and Jessica Jones are a few of my favorites. Plus…Netflix and Hulu take up zero physical space. So…maybe I’ll keep them :). Our family, like most, has stashes of “just-in-case” items throughout our home. Our bathroom cabinets are stocked with extra over-the-counter pain relievers, band-aids, toilet paper, soap, and ice packs because no one wants to run to the store when they are hurting, sick, or mid-wipe. We have extra spices, canned goods, and baking ingredients in our kitchen. And don’t even get me started on the garage! We have so many extra nails and screws, we could build an entire house and still have some left over. However, storage space will be in short supply when we move into a 5th wheel, so I need to start taking a serious look at which items we need to keep on hand versus those we can do without. After all, the stores have shelves and storage rooms for a reason. Right? I am sick and tired of purchasing something only to have it fall apart less than a year later. We live in such a disposable society, and manufacturers know how to take full advantage of it. I have started to purchase higher quality items whenever I can. Unfortunately, those products often come with a much higher price tag. More often than not, when something breaks, we dispose of it and learn to live without it instead of trying to replace it. This one is a tough one for me. I am slightly addicted to my flavored coffee creamer. Seriously, I suspect they put a pinch or two of cocaine in every bottle! We live in a town where it isn’t practical or cost-effective to recycle. As such, everything ends up in the landfill. The waste created from bottles of juice, water, and soda can really add up. Additionally, these items take up more than their fair share of space in my refrigerator. I already do not buy individual serving sizes of any of these items, but there’s still room for improvement. Our family can go without soda, and I can make our family’s drinks in reusable containers. I realize I currently buy many of these items out of habit and convenience, so I’m confident I will be able to stop buying them altogether when the time comes for us to move. Until then, I will do my best to cut out each item one at a time. Sooner or later, I will realize not everything in our current 1,100 square foot house will fit into a 30-foot trailer! These are just some of the things to stop buying because I really don’t need them.